Since I had my son my entire body has gone haywire. I've had to try loads of new things to adjust to my post-baby body. One of the stranger things that happened is my hair has changed texture. Before I had him I could have beautiful Cher hair just using simple products and a quick blow dry. It was absolutely glorious! It was also something I took completely for granted, thinking that my hair would be like that forever and always. Now my hair has taken on a bit of a kinkier texture. It doesn't help that Joey likes to use my hair as a rope, an act that typically ends in a lot of breakage and more frizz. To say my hair is damaged would be an understatement. I've tried several products to try and reverse some of the damage, but I do believe I'm stuck with it until I cut it off! For now, I'm just trying to make my hair it look better than it really is! Maple Holistics' Silk18 shampoo, which they've been so kind as to let me sample for review, has been a massive help. Masking is one of my favorite things in the world, I just don't get to do it much these days with Joey. I try to wait until he is sleeping to mask. It is my me time. 0.8L has come through again with masks that make my skin sing. This time I got to try some masks from SNP, a Korean cosmetics company. They have an entire line of beauty and skincare items, but I was only aware of their various masks. I got the opportunity to try the Otter and the Dragon. They are both fantastically soothing. Dragon is made for soothing and Otter for moisture though I do find that even Otter does a great job soothing any sort of irritation. Thanks to PinchMe.com I have been fortunate enough to try several full sized products from Garnier recently. I'm quite familiar with Garnier. I love their hair products! They tend to smell nice and do good things for my hair. Their skin care, on the other hand, I've had an iffy relationship with. They were one of the first drugstore brands that I remember bringing BB cream here to the US. I remember being so excited only to be so let down. On the other hand, their Blackhead Eliminating Scrub is bomb. After a week of using it twice a day my skin looked fantastic. The products that I got to try are a part of their SkinActive line. That line's biggest seller is the fact that all of the product ingredients are 96% naturally derived. There's no sulfates, dyes, parabens, mineral oil, or silicone. Even cooler is the products are also vegan! Let's start from the bottom up and begin with the Glow Boost 2-in-1 Facial Mask and Scrub that they call a facial in a jar. A few days ago I posted about changes I've made, and now I'm going to share some of my favorite things since going dairy free! Let me tell you this - dairy likes to sneak in. Things you'd never really think about probably have dairy in them in some way, shape, or form. I can't have most of my favorite snacks anymore, and when I cook I have to make a separate dinner for myself. I haven't had junk food in a month because dairy sneaks into most snack foods. Finding substitutions has been fun, like a scavenger hunt. I live in a small town. Luckily the shops here are finally getting with the times when it comes to allergens and have been stocking more foods that are safe for those with food allergies and intolerances. Publix, especially, has been amazing when it comes to getting the food that I need. They have always been a step ahead when it comes to organic and once again they are leading the local market when it comes to safe foods. The first substitution I made was milk because it was the easiest thing to swap. I've tried to switch several times in the past, I just never found milk that I liked. I have tried soy before and really wasn't happy with it flavor wise. This time I decided to go with Almond milk and I'm so glad that I did. First I tried an unsweetened version from Aldi, followed by a sweetened version of the same brand. I prefer unsweetened. My mother picked up this Silk brand for me from Walmart. It isn't bad, but it does have sweetener in it that I am not fond of. It works well for cereal since most cereals are sweetened anyway, so the sweet fits right in. I have also used it in baking, but I can taste the sweetness. My mother tried some of the biscuits I made and she said she couldn't taste a difference. Maybe because I know what the sweetened version tastes like I know what to look for, thus I'll look for that one particular flavor among the others. What is neat about the about the biscuits is the behavior in the oven. Mine made with almond milk browned to a beautiful golden shade while the other biscuits made with cow's milk were significantly darker. I know it's been ages, but I am still alive! I've been battling with depression and anxiety at an all-time extreme. It leaves me not wanting to do much other than take care of my kid and my house, and that's really about it. Earlier this month I decided to start making some changes to start better managing my mental health, as well as my physical health. The first change was ditching dairy. I've always been lactose intolerant as far as I knew, but some dairy I could consume without much issue. At least I thought there wasn't an issue. I didn't find out that there was more of an issue than I thought after I stopped consuming dairy completely and then accidentally contaminated myself. I have found some alternatives that I really like, which I am planning to share at a later date as I really get into my dairy-free routine. Friends in the United States! Tomorrow is a super important day! Most of you who have followed me for a while know I'm passionate about voting. Be the change that you want to see. 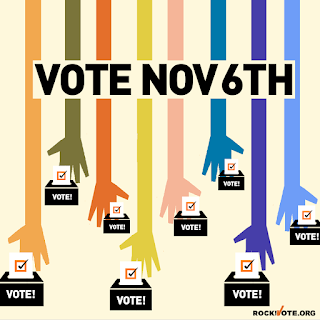 November 6th brings the Midterm Elections, and there are a load of important races happening. Just because it's not a presidential election doesn't mean it's any less important! - One-third of the Senate is up for election. - ALL 435 House of Representative seats are up for election. - 36 states and two territories are holding elections for Governor. - 87 out of 99 state legislative chambers have elections. Those are some wild numbers! It means that there could be real change, but you have to get out there and vote. Do you know where to find your polling place? 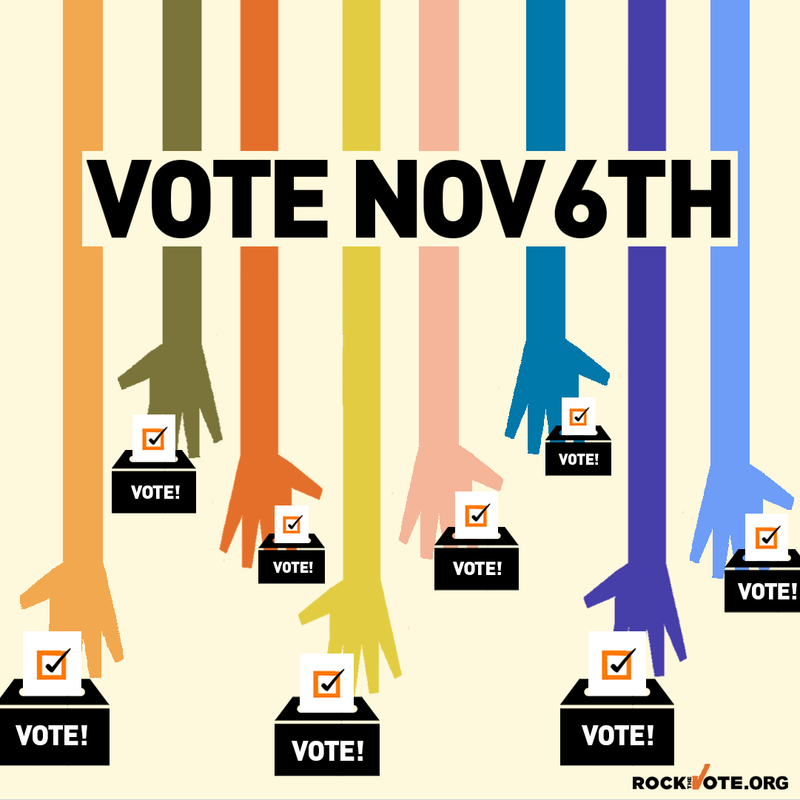 Go to http://rtvote.com/midterms2018 to not only find your polling place, but to also get a sample ballot if you didn't already get one from your local office of elections. Don't forget to study up before you go to the polls - you won't be able to use your phone to study up while voting. Having problems at the polls? If you have any questions or issues at the polls, here's the Election Protection Hotline #: 1-866-OUR-VOTE. Make sure you have your ID! Here in Florida, a photo ID Is required, though you don't have to have your voter's registration card. It varies state by state, so be sure to look up what you need before you arrive. You don't want to be turned away because you don't have the proper identification! If closing time rolls around, and you're still in line, don't fret! Do not get out of line - they are obligated to stay open to allow every last person in line time to vote. Don't let anyone tell you otherwise. Speak up, and know you have the right to vote, even if you are in line at 7:05. If you are having trouble still, there is a thing called a provisional ballot. If your voting status is unclear, you get a provisional ballot that will still allow you to vote. If you are in doubt about this, don't hesitate to call the hotline mentioned above for guidance. This election is extremely important. So many things are on the line - our healthcare, LGBTQ rights, the rights of immigrants and Dreamers. Whether you vote red or blue, get out there and cast your ballot. With any hope, we can make this nation a better place for our children! See you tomorrow at the polls! This post was powered by BrandBacker and RockTheVote.org. Passion about politics and voting is all me! Thanks for reading! Don't forget to share and subscribe! I have been terrible about blogging lately. I've dedicated all of my time to my son, therefore I don't seem to have time to get onto the computer anymore! I spend more of my time on Instagram (check the link in the sidebar! ), though I'm hoping to get back here a bit more now that my son is one and being a tad more independent. I've got loads to tell you about my journey through motherhood! Until then, I hope to see you on Insta! My skincare routine is something that is rather special to me. It’s my me time. As a new parent, having that time to myself is really important. It’s a reminder that I’m more than just a caregiver to a little boy, that I have to care for myself as well if I want to be the best mom I can be for him. I may be a mom, but I’m still me. A very tired me! Depending on the amount of time I have, and products on hand, my routine can be the bare bones basic or a full blown ten step Korean routine, it really varies. It's gotten a lot easier now that Joey is six months old. Those first few months it was really hectic finding any time to myself! The routine I’m laying out is my general routine if I have a lot of time to devote to my skincare. I just saw this on youtube and it was too funny not to share. Does our president really eat like this? You'd think that someone who came from such money would eat better than all of that junk. I am in no way a Trump fan at all, I just wonder how accurate this video is to be honest. How can a human being live off of that much Diet Coke? I kinda feel sick just watching this. I haven't done one of these in a while, and I'm in a Willam mood so here's the song of the night! I'm back with another shampoo review! I've tried the Tea Tree Shampoo a few months ago, and this time I had the chance to try the Argan oil shampoo from Maple Holistics. It's been years since we'd been hit hard with a storm, so when Irma was coming in hot we were a little irritated. Weekend plans totally ruined. Yard is gonna flood, just one big inconvenience. I was feeling pretty calm, mainly because we've been through this song and dance many times before. We are Floridians, we got this. One of my favorite things about myself is my hair. I've always put a little more care into taking care of it versus other things in my life, and it's always shown for it. Vitamins, oils, shampoos, treatments, I've tried it all. The most recent thing I've tried is the Tea Tree Oil shampoo from Maple Holistics. The month of August was insane for us. Here it is in pictures!